Seven year old Tim has gotten used to being the center of his parents' attention...that is, until his new baby brother arrives and starts stealing all their affection. Tim instantly knows something isn't right with this baby and discovers his new brother is actually a manager at Baby Corp, only masquerading as a child to stop the release of Puppy Co.'s new puppy that will steal the love and attention away from babies forever. "The Boss Baby" is directed by Tom McGrath, who has directed other animated features like "Madagascar" and its sequels, as well as "Megamind." It is written by Michael McCullers, based on a book by Marla Frazee. It stars Alec Baldwin as the titular Boss Baby, a businessman-like baby from Baby Corp, where all the world's infant are manufactured for either families or for management. 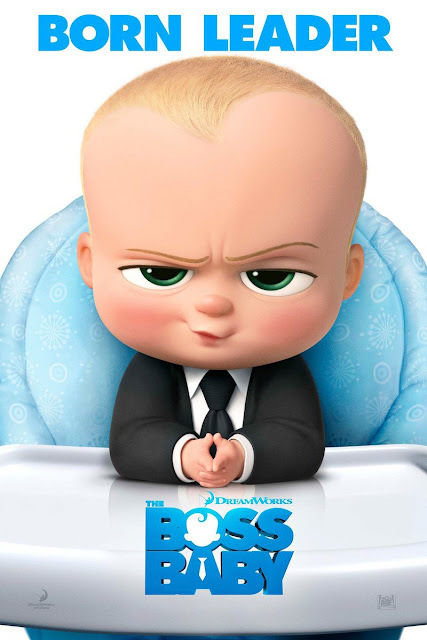 This Boss Baby was created with middle management in its veins, all grown up, but still in the body of a newborn. He has been assigned a mission to investigate the release of Puppy Co.'s new puppy, a creature so adorable and so cute, it will steal all of the love away from babies. Boss Baby is assigned to a family employed at Puppy Co. that consists of Mom and Dad, voiced by Jimmy Kimmel and Lisa Kudrow, and their seven-year-old son Tim, voiced by Miles Bakshi. It is actually the adult Tim, voiced by Tobey Maguire, who narrates the whole story. This feature seems to have a few good ideas early on. It looks as if it is going to explore what it's like for an older child to have a new sibling introduced into the family through an allegorical tale about a "Boss Baby." It would appear the film is has been set up this way as a seven-year-old with an overactive imagination may view his new baby brother as an over-demanding boss. Unfortunately and unexpectedly, it loses its way soon after it begins as it doesn't really have anything smart or insightful to say. Instead, McGrath and McCullers tend to rely on the typical poop, doody, and fart jokes we've come to expect from most animated film features not made by Disney or Pixar. There are also running gags about a baby acting like a businessman, which is cute for about five minutes, but gets boring shortly after the notion is introduced. The script is also loaded with a ton of pop culture references to films and music which are clearly targeted more towards the parents of the kids who may be in attendance. We seriously doubt kids are going to get references to The Beatles or "Glengarry Glen Ross." Never fear, there are plenty of references the kiddos may get as well, though these instances offer little more than saying "Hey! Remember this thing you probably like better than what you are watching right now? Well, now that we referenced it, you'll like us too, right?!" Finally, there are also a few questionable jokes that seem a bit mature for a kids movie. While their intentions seems comedic, they feels wholly and inappropriately out of place. Also, there seems to be a weird fixation on butts in animated movies lately, but "The Boss Baby" takes it to the nth degree. These jokes may make some overly cautious parents raise an eyebrow. We know they made us go "uhhhhhhhhhmmmm....." a few times and we're not even parents. 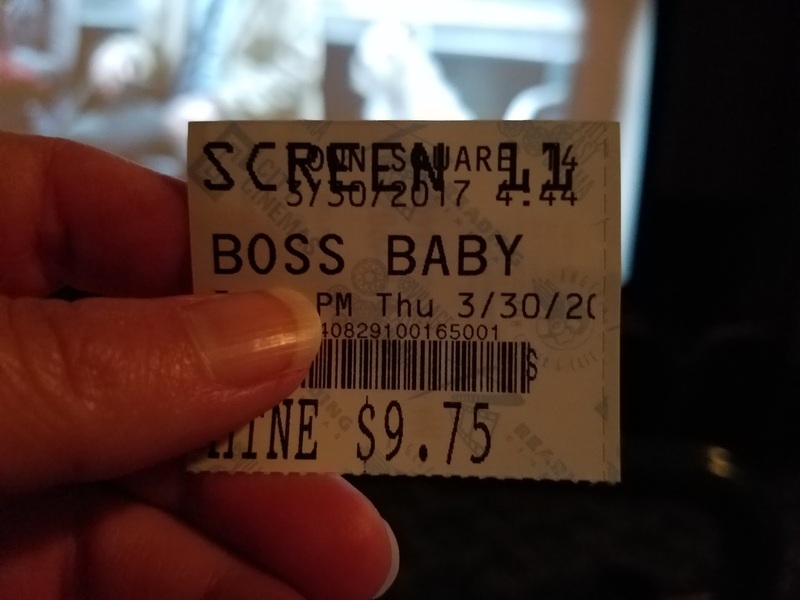 "The Boss Baby" is not all bad. Alec Baldwin and Miles Bakshi do excellent jobs in their respective voice over roles and have really great chemistry with one another. This movie as a whole does have some cool animation choices from time to time, especially early on when they show the adventures of Tim's imagination on full display. There is also a fun, upbeat score made by Hans Zimmer and Steve Mazzaro that we enjoyed a lot. Beyond these factors, this animated feature is a rather mediocre affair. Of course, we are not the target of this movie, especially since we don't have children...if we are being honest, we were sort of rooting more for the puppies.